The Tràigh Mhòr (big beach) is over a mile long and is definitely one of the beauty spots and must-sees of North-East Lewis. 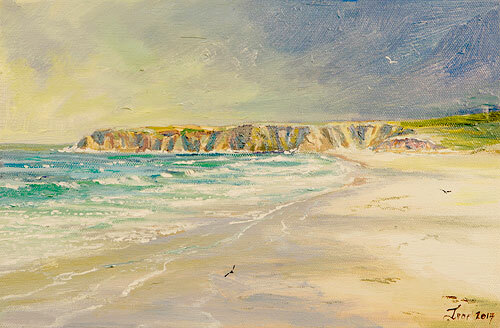 A sandy beach, sheltered by dunes, it is an inspiring walk and has kept me thirsty as an artist to paint it as subject matter over the years. It is situated fourteen miles outside Stornoway in the village of Tolsta. On a clear day, across The Minch the mountains of Sutherland can clearly be seen.